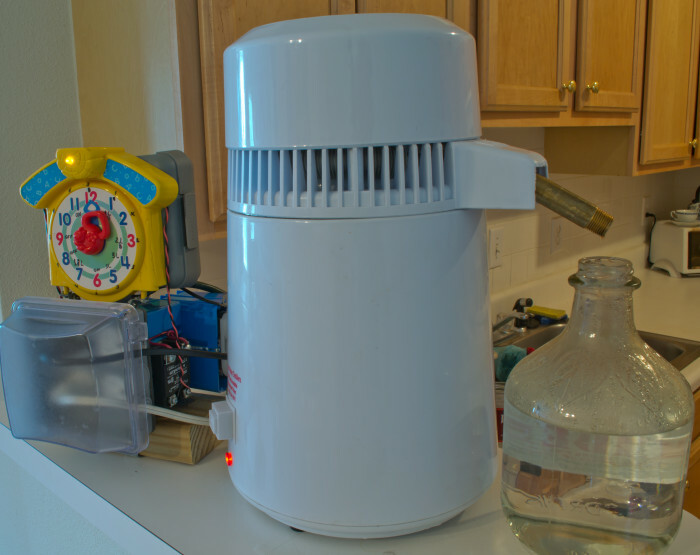 The device’s design utilizes a circuit breaker that has been wired to turn off the heating element and condenser fan after the water completely evaporates, by responding to the large current increase. This is counter productive because the impurities that you are leaving behind by distilling in the first place are now being vaporized and condensing into the freshly distilled water! I’ve also found numerous owners (after I purchased it) who comment that after a few distillations this way, the unit would turn off, only to never turn back on again. This is because once there is no water left in the boiling chamber to remove the thermal energy in the form of steam, the temperature quickly rises above the boiling temperature of water, causing the heating element to continue to expand, risking a fracture of the element. The majority of problems were related to the circuit breaker failing or the heating element cracking. With the heating element welded onto the bottom of the stainless steel container, repairing this damage would cost more than the entire worth of the unit. Before my modification, I used two timers to distill with the stock unit. The amount of water to fill the collection vessel is added to the boiling chamber as well as a small amount of extra water that will remain in the unit after the vessel is full, ensuring the holding tank does not run dry. I would set a timer for 25-30 minutes after first turning on the unit. This allows the water to heat up enough to distil about 50 ml (called the foreshot among moonshiners). This amount is comprised of all the compounds that evaporate at temperatures below water’s boiling temperature (100 C), such as many volatile organic compounds (such as chloride and fluoride ions). If I were distilling ethanol, this would be undesirable alcohols (such as methanol), ketones, aldehydes, and other byproducts of yeast fermentation. Since I am distilling tap water, the foreshot is tossed down the drain. Now a clean vessel can be placed under the drip to collect the next amount of water that’s being distilled. This is where another timer is set to the amount of time it would take to fill the vessel but not run the boiling chamber dry. Fed up with this method for being prone to error (miss the last timer, ruin the water if not the heating element or circuit breaker), I set out to automate the process and make it user-friendly and safe for anyone in my household to operate. This is where I salvaged a few pieces from the control box of a temperature/humidity controlled terrarium from a previous project. 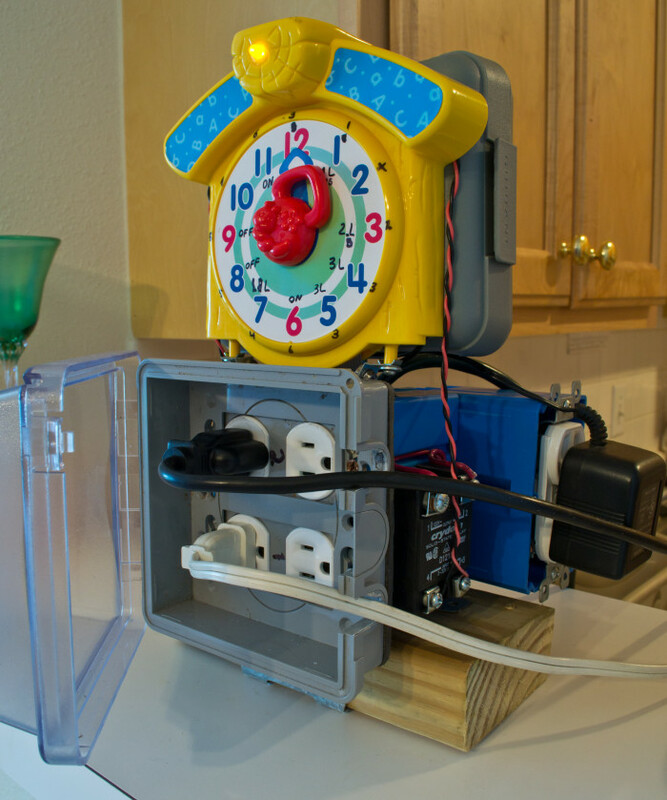 This includes two Crydom D1210 120 VAC relays, controlling an electrical outlets, a always-on wall outlet for the power adapter that powers an Arduino, and an electronic rotary dial for input. The dial was removed from a toy clock tower that was left at my apartment’s garbage area. Everything is connected to a home-built shield that plugs into the Arduino. The dial input varies the amount of time the heating element is to be turned on and when the fan starts, as the fan is unnecessary until the water begins boiling. This approach allows different sized vessels to be filled without having to read from a list of times for each vessel’s volume and manually set two timers. User input is required (turning the knob any direction) to turn the unit on. This prevents the unit from turning on after a power outage. 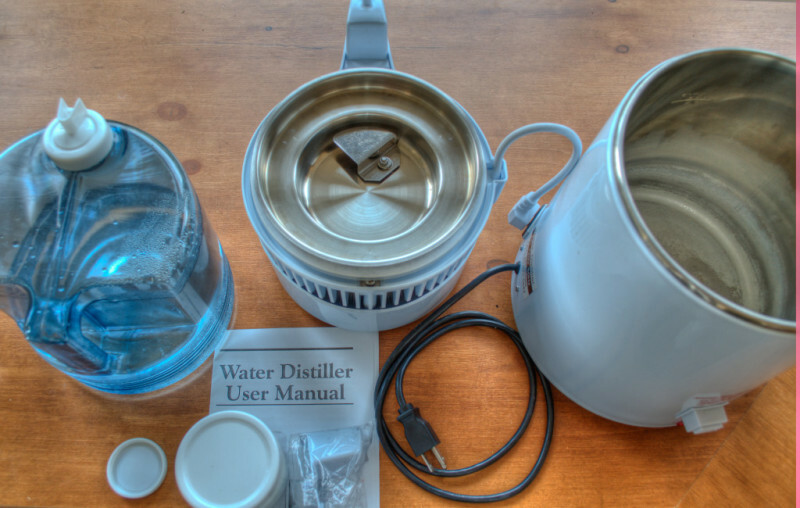 The still’s heating element is rated at 250 watts and can produce 1 liter of distilled water per hour. I routinely distill over a gallon a day. The Arduino source code can be found here on Github.